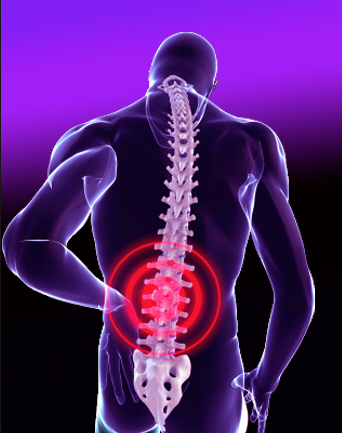 A discography is a procedure used to evaluate patients with persistent, chronic back pain. The technique is used for people who have not responded to extensive conservative care regiments. 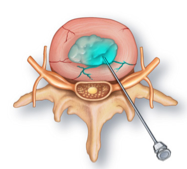 The most common reason for a discogram is surgical planning before a lumbar vertebra fusion. The pain management specialists believe the discogram offers information about discogenic (disc-related) back pain. What are the indications for a discogram? What are the benefits of the discography procedure? The discogram is used to determine if the disc is causing pain. Really abnormal appearing discs may not cause pain, whereas a minimally disrupted disc could be associated with severe pain. When performed correctly, the discogram is designed to induce pain in a disease, degenerated, or sensitive disc. Spinal fusion is often necessary when the disc is problematic. How do I prepare for the discogram procedure? You will first meet with the pain management specialist, who will inquire about your symptoms, take a medical history, and perform a complete comprehensive examination. Because the procedure is minimally invasive, you should discuss your medications with the doctor beforehand. Certain blood-thinning drugs are to be held for several days. Do not eat or drink after midnight, and wear loose-fitting clothing to the medical facility. When you arrive, a nurse discusses the procedure pros and cons, and has you sign a consent form. After you change into a gown, the nurse takes your vital signs and places an IV catheter in your arm. What can I expect during the discography test? You are placed on a special table face-down. A mild sedative is given to keep you comfortable during the procedure. After cleaning your back with an antiseptic solution, the doctor numbs the region with an anesthetic. The fluoroscope is used to guide the procedure needle into the affected disc. 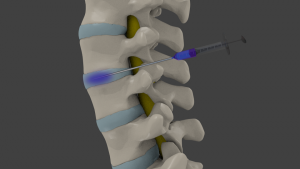 When contrast dye is injected into the disc, the doctor will ask you questions about what you feel. The discogram procedure takes about an hour to perform. After removing the procedure needle, a small bandage is applied to your back. The IV catheter will also be removed, and a Band-aid will be applied to the site. What does pressurizing the discs mean? Inserting small amounts of sterile liquid or contrast dye into the disc is called pressurization or pressurizing the disc. When this is one, you could feel nothing, feel pain, or just feel pressure. Familiar pain means the pain is something you have felt when moving around at home. After each disc is pressurized, the doctor will look at images obtained from the fluoroscopic system. What can I expect after the discography procedure? After the procedure, you are monitored in the recovery area for several minutes (30-45). You will awaken from sedation, and feel slightly groggy. Soreness at the injection sites is expected, but you can use an ice pack to relieve this pain. You should rest for 1-2 days, and then gradually return to usual activities as tolerated. Is the discogram procedure useful? Discogenic pain is the most common reason for chronic lower back pain. The efficacy of pressure-controlled discography has been found to be around 70-85%. The test is used for clinical decision-making for patients with chronic back pain. In a recent study, researchers concluded that the discogram was useful for diagnosing discogenic pain. Shin DA, Kim HI, Jung JH, et al. (2006). Diagnostic relevance of pressure-controlled discography. J Kor Med Sci.